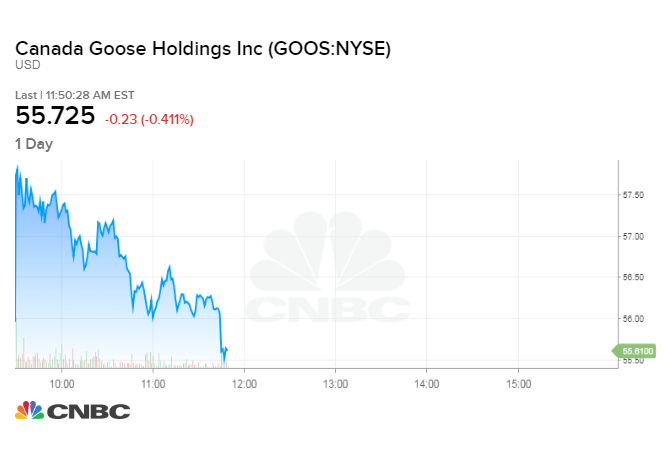 Shares of Canada Goose, the maker of luxury outergear, have tumbled 17 percent over the last one week and there have been reports of a call in China to boycott the brand. China has demanded the release of Meng Wanzhou, the chief financial officer of Chinese technology firm Huawei, who was arrested in Canada on Dec. 1. Chinese consumers make up one-third of the world's luxury market and are seen as a key area of growth for North American and European luxury brands. Canada Goose brand parkas in a store in New York. A $1,000 winter coat has become an unlikely lightning rod for the Chinese public's anger over last weekend's arrest of a senior technology executive in Canada. 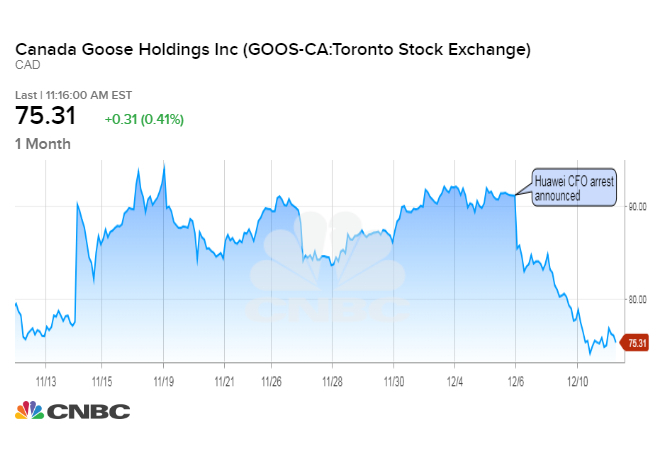 Shares of Canada Goose Holdings, the maker of the luxury parkas, have dropped 17 percent over the last one week, and the Canadian newspaper Financial Post reports that there are calls on social media in China to boycott the brand. It is the second time this week a major Western consumer brand has taken a hit related to China. Apple shares tumbled 2 percent on Monday and then recovered after a court in China granted an injunction to chipmaker Qualcomm that banned the sale of certain iPhones in China. Apple said the ban only applies to phones running on an older operating system. Chinese consumers make up one-third of the world's luxury market, according to analyst estimates, and the country is a major growth market for North American and European brands. Canada Goose has been making efforts to expand in China, opening locations in Hong Kong and Beijing, where it will be competing with local knockoff brands. But now a brewing trade conflict and the targeting of the Chinese technology executive threatens to cut into some of that growth at a time when China's economic slowdown means luxury spending there is now slowing. UBS research said luxury spending in China grew 12 percent in the third quarter compared with 17 percent in the second quarter, and it is estimated to rise 10 percent next year. China has demanded the release of Meng Wanzhou, the chief financial officer of Chinese technology firm Huawei. She was arrested in Canada Dec. 1 on accusations of breaking U.S. sanctions on Iran and faces extradition to the U.S.
Canada Goose is perhaps a target because of its name. But shares of the coat maker are still up about 80 percent this year. Its popularity in China took off after Jack Ma, the billionaire founder of Chinese conglomerate Alibaba, was spotted wearing a Canada Goose coat at various high-profile events this year, including the World Economic Forum in Davos, Switzerland. Canada Goose shares rose slightly in early trading on Tuesday as financial markets bet progress was being made in trade talks with China. But then once The Washington Post reported that the White House was planning to condemn China over economic espionage, Canada Goose shares rolled over. The parka maker is caught in the middle of the trade war between the two superpowers.